We mixed the timeless European lines of the OCTAVIA with a sporty aesthetic and created the OCTAVIA RS. Its racy look is complimented by a slick chassis and ingenious functionality. The sedan version features a spoiler, which increases the stability of the vehicle at faster speeds. The rear lights, with familiar C-shaped illumination, are always equipped with LEDs as well as the lighting of the registration plate. And what’s power and beauty without a great set of wheels? The OCTAVIA RS rides proudly on 18” Gemini Anthracite wheels. The exhaust pipe end pieces in chrome finish further accentuate the sporty look of the car. The sporty aesthetic – which comes in an exclusive black styling – continues inside the spacious interior of the OCTAVIA RS. Numerous details, like the original RS logo on the steering wheel, the seats and gearstick, only help accentuate its racy nature. With a choice of ten colour options, you can make the interior of the RS even more attractive when you turn the ambient lighting on. The 3-spoke multifunctional sports steering wheel wrapped in perforated leather is adorned with an original RS plaque. The exceptional design goes hand in hand with advanced technology. The sports front seats feature integrated headrests. The original RS logo is embroidered on the backrests. 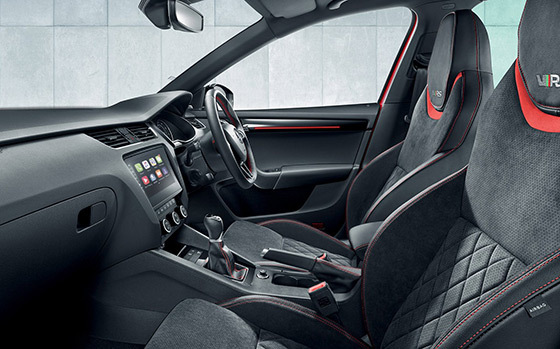 The upholstery in a combination of Alcantara®/ leather# with red stitching. Equally interesting is the combination of fabric/ leather#, which comes as standard. The decorative door sill strips in the front carry an original RS inscription. The noble steel foot pedal covers are stylish plus enhance the driver’s comfort. While the driver enjoys the atmosphere of the sports cockpit, passengers indulge in maximum comfort. #Leather appointed upholestery have a combination of genuine and artificial leather, but are not wholly leather. With its powerful engines and spacious interior, the OCTAVIA RS is truly unique - because it combines a dynamic driving experience with the comfort you expect from a family car. The infotainment system allows different drivers to create their own individual preferences. These include, for example, setting the driving mode, the electrically-adjustable driver seat, air conditioning, radio and navigation system. 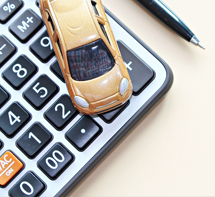 A personalised car is provided with three keys. 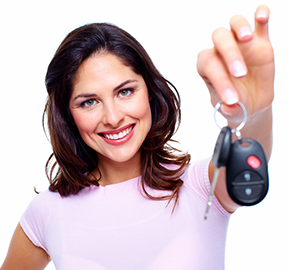 When the key is used to unlock the car, the functions are automatically adjusted to the driver’s saved settings. Adaptive Chassis Control continuously evaluates and responds to various driving situations (braking, acceleration, turning), adapting the damping and steering characteristics. As part of the infotainment menu, Driving Mode Selection allows the driver to adapt the car's behaviour to their preference or needs. Five driving modes are available: Normal, Sport, Eco, Comfort and Individual (Individual allowing the driver to configure their own settings). The car will then adapt the engine torque, accelerator sensitivity, power steering, headlight control (with AFS), DSG transmission, and air conditioning to suit the profile selected. The car features Performance Mode Select, which includes the Performance Sound Generator function allowing the sound of the engine in the cabin to be set to the normal, eco or sport mode. The RS has a sporty heart, no matter which engine you choose. 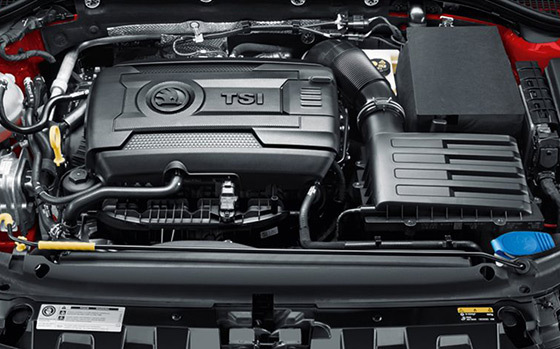 Our range includes a 2.0 TSI / 169 kW (petrol) and 2.0 TDI / 135 kW (diesel). 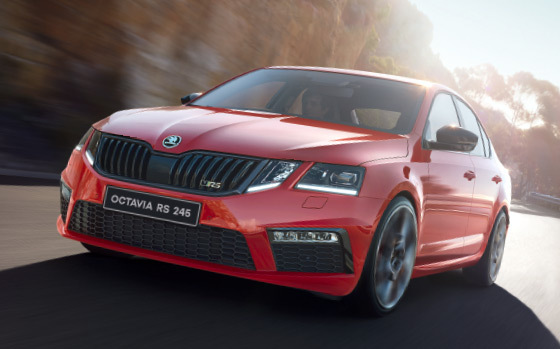 For those really seeking to turbocharge their every day drive, meet the OCTAVIA RS 245. With all the comfort, style and sporty aesthetics of the OCTAVIA RS and something a little meaner under the bonnet. Octavia Sport features black design elements including rear spoiler, mirror caps and styling decals for a sportier look. It also includes a host of sport design features comprising of a 3-spoke sports steering wheel, Sport Seats, 18" Turini black alloys and LED headlights with Adaptive Frontlight system. The black external side-view mirror covers are one of many sporty details on the OCTAVIA RS 245. 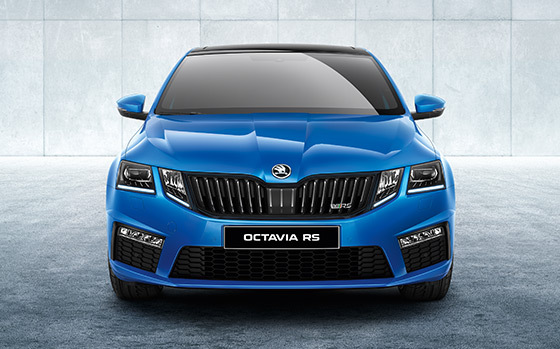 The aggressive front features a glossy back grille frame as well as the iconic RS badge. The comfortable Alcantara® leather appointed upholstery o sports seats are accessorised with red stitching and the RS logo. Electrically adjustable front seats are standard on the OCTAVIA RS 245. The exclusive 19” Xtreme alloy wheels in black enhance the racy look and feel of the OCTAVIA RS 245’s exterior. The exhaust pipe has been given a glossy black finish and has been specially tuned to produce the engine’s characteristic sporty sound. oLeather appointed seat upholstery have a combination of genuine and artificial leather, but are not wholly leather.